This advertisement was published in Popular Computing Weekly 31 Jan 1985. It features Mistertronic. 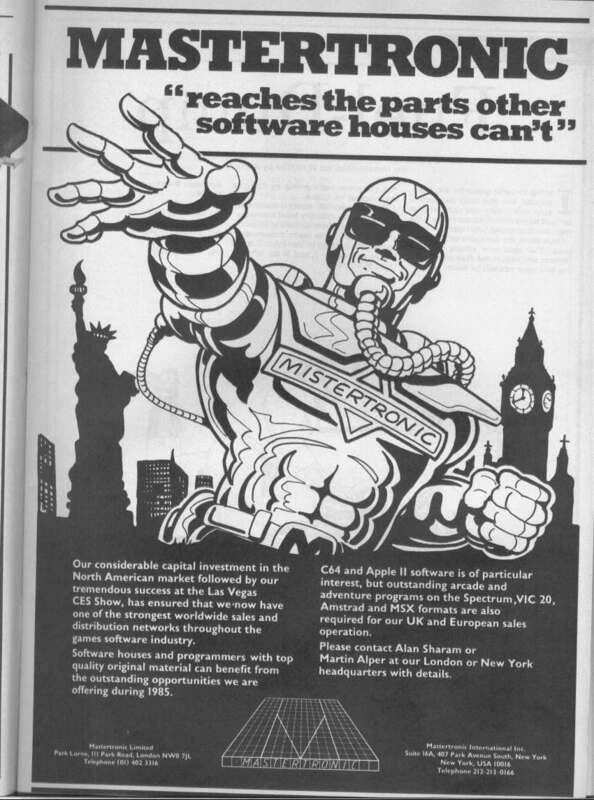 More important, it talks about capital investment in the USA and mentions an address for Mastertronic International Inc in New York. Our representative in the USA at this time was Stuart Kaye (Colin Gershinson's brother-in-law) who was based in California so it is not clear who was the occupant of suite 16a, 407 Park Avenue South. It might simply have been a forwarding address. Clearly, Mastertronic Inc, our subsidiary based in Frederick, Maryland, was not trading at this time. In later years we had no difficulties in finding sources of product but in early 1985 Mastertronic was still trying to establish its presence on both sides of the Atlantic.